Does Arrogate Still Rule in Baffertland? It was like Samson, Hercules, and Achilles all losing their God-given strength and powers. Even in legend and myth, the most famous indestructible heroes eventually became mortal and met their fate. Since his remarkable conquest in the Dubai World Cup following a run of mind-blowing victories, Arrogate had convinced the world he was invincible, like some mythical warrior granted ethereal powers. Then just as we were about to place him on Mt. Olympus, despite his brief reign, he went to Del Mar for his next challenge that seemed a mere formality, but he shockingly wound up with a haircut, a poisoned shirt, and an arrow in his heel. Metaphorically, of course. In other words you never know what events are going to contribute to an immortal's demise. Now that Thoroughbred racing's most revered hero has proven to be mortal after all, what do the gods have in store for him as he desperately attempts to salvage what remains of his once lofty reputation? That salvation would have to come in the Breeders' Cup Classic over the same battlefield on which he has now twice tasted defeat. Not only must he try to regain his powers on what has proven to be hostile terrain, two of his most formidable foes will be from his own barn, and one of whom has already defeated him in what appeared to be a fair fight. Just as Arrogate burst on the national scene last year with great fanfare in the historic Travers Stakes, so too has his successor, West Coast, a colt Bob Baffert thought so highly of he seriously contemplated running him in the Belmont Stakes, despite having only four starts in his life. When he trounced his opposition in the Easy Goer Stakes on the same card, Baffert started having second thoughts about whether he made the right decision to take the easier route. Baffert must have known he had something special in the colt's career debut. Although he finished a strong second to stablemate and wire-to-wire winner Bronze Age, what really convinced Baffert that West Coast had a bright future was the fact that he finished 11 lengths ahead of the one and only Haskin. So was born the legacy of Haskin, who can now boast he finished closer to West Coast than the Kentucky Derby winner, the Preakness winner, and the 1-2 finishers of the Haskell Invitational, not to mention the Kentucky Derby runner-up. (Sorry, had to get that in. I have no shame). 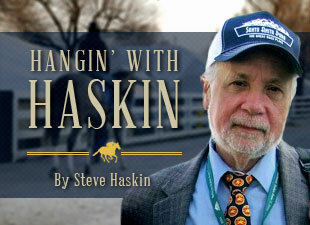 To deviate even farther from the subject at hand, there is an APB out on Haskin in case anyone comes across a handsome son of Union Rags who runs kind of slowly and has been known to take unwanted vacations from the entries and worktab. Getting back to more newsworthy matters, although West Coast did not annihilate his opponents in the Travers the way Arrogate did in one of the most freakish performances in memory, he, like his predecessor, won on the engine the whole way, drawing off to a 3 1/4-length score, coming home his final quarter in a snappy :24 1/5. In fact he :24'd them to death, with fractions of :23 4/5, :24 1/5, :24 flat, :24 2/5, and :24 1/5. In a year where a 100 Beyer speed figure by a 3-year-old is considered high, West Coast finally broke out with a hefty 108 Beyer. With the exception of our old friend Gunnevera, West Coast made this year's Triple Crown seem irrelevant in the grand scheme of things. But then Bob Baffert has a way of doing that. To borrow the lines from the song "That's Life," you can hear Baffert singing the past two years, "You're riding high in April, Shot down in May. But I know I'm gonna change that tune, When I'm back on top, back on top in, uh, August?" What made West Coast's manner of victory so surprising is that Baffert seemingly had taken the colt's early speed away and turned him into a powerful closer who had come from sixth to win his previous two starts. And what was ironic about the victory was that Baffert had come to last year's Travers with two colts, one of them, American Freedom, far more accomplished than the other. However, it was American Freedom, winner of the Iowa Derby, Sir Barton Stakes, and beaten a neck in the Haskell Invitational, who finished second, 13 lengths behind stablemate Arrogate, making his stakes debut. American Freedom is owned by Gary and Mary West, who returned this year to get their Travers victory. So Baffert, loses Mastery, one of the most brilliant and promising 3-year-olds he's ever trained, and still wins the Travers and Los Alamitos Derby with a colt who didn't even make his career debut until Feb. 18, just like Arrogate didn't make his debut until April 17. In another bit of irony, Baffert wins back-to-back Travers with an 11-1 shot and a 6-1 shot after losing with a 1-5 Triple Crown winner. Racing, as we all know, is a contradiction of emotions, as joy can turn to sorrow in a heartbeat, and vice versa. Here was Baffert winning the $1 million Pacific Classic one week and the $1.25 million Travers Stakes the next week, yet you know his heart is still aching over the defeat of Arrogate, at his own hands. He is of course happy for the victorious Collected's owners, but to orchestrate the defeat of your superstar in a race he desperately needed to win to restore his reputation showed just how diabolical the plot twists can be in this game. Baffert guided Arrogate right up to the gates of the pantheon and then inadvertently prevented him from entering. But Baffert didn't get Arrogate beat in the Pacific Classic. Arrogate got Arrogate beat. The colt we saw in the Travers, Breeders' Cup Classic, Pegasus World Cup, and Dubai World Cup would have devoured Collected going a mile and a quarter. Take Collected out of the Pacific Classic and, yes, Arrogate wins, but it would have been merely a smokescreen. In reality, we still would have had a colt far removed from the magnificent champion who performed such spectacular feats over the past year. After all, can you imagine Arrogate at his best losing ground on the far turn and then failing to catch a horse with a sprinter/miler pedigree who was closing his final quarter in :25 2/5? The Arrogate we knew who would come home his final quarter in :23 4/5 and :24 flat would have been breathing down Collected's throat turning for home and would have blown right by him. If he was able to run down California Chrome and Gun Runner at 1 1/4 miles it would seem inconceivable for him not to be able to run down Collected, who is a very good horse, but has a speed-oriented pedigree and was stretching out from 1 1/16 miles to 1 1/4 miles. Is it nothing more than a disdain for the Del Mar surface? You can't blame the surface for the San Diego debacle, in which he never at any point had an inclination to run and just ambled around there as if his mind and body were somewhere else. While he obviously ran a much improved race in the Pacific Classic he did nothing to inspire confidence coming back over the same track in the Breeders' Cup Classic. Mt. Olympus most likely is out of reach now and the gates of the pantheon will remain closed to him. But that does not mean he has lost all hope of catapulting himself back to the top. There is no reason that we know why he ran the way he did in the San Diego and why he failed to demonstrate that relentless closing kick in the Pacific Classic. He did not move with the same authority, and with that powerful humongous stride, that we've seen in past races. It would be a shame never to see him perform again on a racetrack other than Del Mar, just to know for sure if it is the surface of this particular oval that is indeed the culprit or whether his glory merely was fleeting and he reached some kind of temporary nirvana starting with the Travers. The latter would seem unlikely, considering the varying degrees of brilliance he displayed from coast to coast and halfway around the world and the extended period of time he was able to perform at such a high level. Could it be those four races will be the only text to fill the mini chapter he will write in the history books? The inkwell is running dry and there are very few words left to be written. Let's hope those words once again move us and stir the emotions like they have in the past. No one wants to hear an unfinished symphony. His was a work of art. It just needs to be completed.